Oh no! You’ve got aphids! Luckily, they are one of the most common garden pests, so you can know that you are not alone. And there are a lot of effective ways to get rid of them. 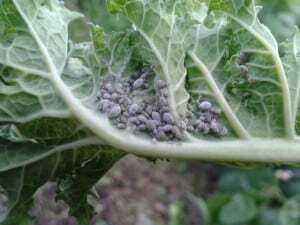 Aphids on the underside of a kale leaf. Aphids are a very common, small round insect that varies in color from green to brown to grey. They damage plants by sucking the plant juices out of the foliage, leaving white or grey spots and curled leaves. Aphids are usually very easy to find on the plant because they tend to cluster in the center of the plant or on the underside of leaves. Aphids tend to attack weaker plants that are already showing signs of stress, so it is very common to see aphids at the end of the growing season when plants are beginning to die back. Sometimes you’ll also see aphids appear when there is too much, or too little nitrogen in the soil. Did you apply fertilizer this year? If you applied too much nitrogen fertilizer, you may be seeing an aphid infestation as a result. Spray with water. The number one thing to break the life cycle of aphids is water. Using a jet spray setting on your garden hose (though not too strong to damage the plant foliage), spray your infected plants down to literally knocks the aphids off your plant. Do this once or twice a day for about a week, or until you see a reduction in the aphid population. Pull off lower leaves that are yellow and dying back to increase airflow around the plant. Pull off and discard leaves (or whole plants) with particularly bad aphid infestations to lower the aphid population in the garden. Spray the infected plants with “Safer Soap” (picked up at any garden store) or diluted dish soap in water. This will kill the aphids without having negative effects on the plant itself. It is best to spray in the early morning or late evening, so as not to burn the plants in the heat of the day. The plant is still perfectly fine to eat after being sprayed with a soap solution, just be sure the rinse your produce well before eating! Encourage beneficial insects in the garden. Ladybugs, green lacewings, syrphid flies, and parasitic wasps are all natural predators to aphids. As a preventative measure, plant flowering crops that attract these predators, like sweet alyssum, marigolds, yarrow, calendula, and many other flowering plants. Quick and easy diagnosis of my problem–earth friendly solution. Thank you, Urban Farm Co! Just remember that even if you get rid of aphids by spraying them off, they still leave behind excrement and secretions people love to call “honeydew”. It’s far from “honey”, it’s a waste product of the aphid. Eeeeew!